Few will argue the impact Star Trek trading cards have had on the hobby. Since 1967, dozens of sets have been released for the original series alone. Together they cover all angles of the show. 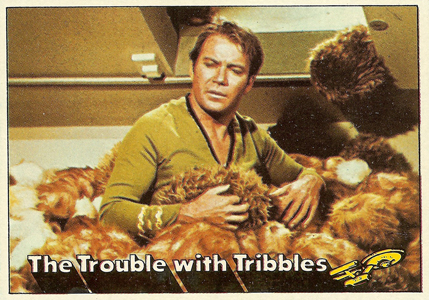 1976 Topps Star Trek marked the second time the franchise appeared in a set of mainstream trading cards. It was also the first to use color images. 1976 Topps Star Trek has an 88-card base set. Cards have a thin white border that gives way to a large image taken directly from the show. Card fronts have a small descriptive captive that leads to a more in-depth writeup on the back. A miniature U.S.S. Enterprise accompanies the caption. Unlike 1967 Leaf Star Trek, the text matches up with something that actually happened in the show. As with most Topps entertainment card sets of the era, 1976 Topps Star Trek includes a sticker in every pack. The checklist has 22 different stickers. They come with the classic Topps sticker design. A die-cut image has a thick single-color border. The background has a space theme. The vast majority of the images are head shots from various characters. 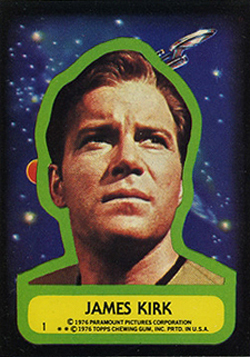 1976 Topps Star Trek is extremely popular with collectors. The cards are somewhat common but still command strong prices. Complete sets can fetch hundreds of dollars. Star Trek 1976 Topps cards - Lot of 8 Very Nice! 15 "Live Long and Prosper"
2 Mr. Spock - Unearthly! I have a 1976 Topps Captain’s Log set, it is missing card # 24. I also have a rare SCHUSTER’S PHILADELPHIA INTERNATIONAL STARTREKCONVENTION ticket ! How much do you think that ticket is worth, knowing that the turn out to that show was at a loss ? How many cards came in a pack from 1976? From what I can gather, 5 cards and 1 sticker per pack. Just reading through and thought I’d answer some of the questions. Idil, the value is really going to be based on the condition of your set. I have sold several of these sets for under $100. However, I have a highly PSA graded set that is worth thousands. Marc, Ryan is correct. Each pack came with 5 cards and 1 sticker. I actually have a bunch of these packs unopened. I actually have an unopened box of these� it’s still sealed. I have no idea of how to value that, or really, who to ask. In addition to that box� I have two 36″ card boxes, and several other sets. IS there a definitive guide? I ask that you get back to me, and let me know, if you have the Set of Star Trek Trading Cards from 1976 or ans set of Trading Cards, from 1976-1990, featuring the Women from the Planet Orion? I am looking for the Original Set of Star Trek, with that Episode in it! I ask that you get back to me, and let me know if youi have the Woman of the Planet Orion, on the Original Star Trek please! I contacted the Tops card Company, but no reply! I look to an answer from my you. I ask that you get back to me, and let me know, who can I contact about buying the Original Star Trek Trading Card Series, featuring the Woman, from the Planet Orion? How much is he set? Who do I contact, about buying the 1976 Star Trek Series Trading Cards, featuring, the Woman from the Planet Orion? I look to your reply, ASAP. Hi, I have what I thought was a complete set of the 197 Topps cards – but I only have 1 – 72 and on the backs of the cards it says ’36 of 72′ for example. What are the extra 16 cards? Were they released later? (I also do not have any stickers – guess I didn’t keep those! Star Trek George Takei Autograph On Paper.